Boston United paid £500 in agent fees in the past year, according to the Football Association. Figures released today list the monies paid to intermediaries in the period between February 1, 2018 and January 31, 2019. 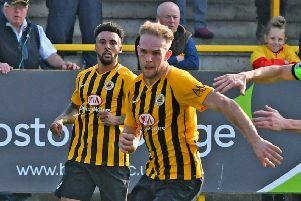 And while fellow non-league teams such as Salford City (£76,338), Chesterfield (£72,943) and Leyton Orient (£30,067) splashed the cash, the Pilgrims were joint-lowest on the list which stretches from the Premier League to non-league. Craig Elliott’s side spent the same amount on agents as South Shields and Alfreton Town, while some non-league clubs managed to not spend a penny. Fellow National League sides on the list were title-chasers Stockport County (£900), York City (£13,455), Southport (£1,500), Hereford (£1,500) and struggling Guiseley (£8,820), who were relegated from the National League within this period. Harrogate Town, promoted from the National League North alongside Salford last season, spent £9,479. The highest spenders on the list were Liverpool, who paid out a staggering £43.7 million. United brought in 43 players in this period, beginning with Wes Atkinson and ending with Nicky Wroe, which works out as an average of £11.62 per player. However, the figures released by the FA only state one Boston payment in this period, in relation to the signing of striker Jonny Margetts this summer. The FA is required to publish annual details of total payments made by clubs to registered intermediaries and single transaction(s) in which each registered intermediary was involved under FIFAs regulations.